Are you a movie lover? And want to book movies at the lowest prices? Here your search ends. Paytm has introduced the booking of movie tickets across the India. You can grab the cashback on booking as well with the new Paytm movie tickets coupon and New Years Offers. You can book movie tickets across halls like PVR, Imax, Inox etc. While making the payment you can choose credit or debit cards, net banking or wallet. 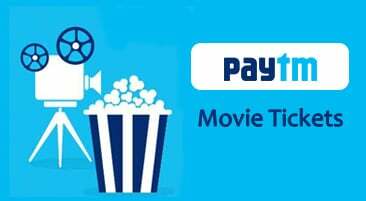 New User OFFER: Get upto Rs.100 on your Movie ticket booking on Paytm. Minimum 2 movie ticket booking. FLAT Rs.160 on your first Movie ticket booking on Paytm. Minimum 2 movie ticket booking. Valid for first movie ticket booking on Paytm. First of all, visit the Paytm Movie Tickets offers page by Clicking this link. Then select the city from the given choices. Now choose cinema or movie to be booked. Select show timing and number of seats. Apply promo code: MOVIEFEE to eligible for cashback (100% cashback on convenience fee). Make payment via cc/ dc/ net banking/ wallet. Are these benefits not enough? You can try the new Bookmyshow or PVR Cinemas coupons now. The BMS discount offers may not provide you the best cashback offers. But, they have got some exciting instant discount codes with Bank cards offers. So, you must try them now if you are not satisfied with benefits on Paytm movie website. I got a movie voucher on my Paytm mall shopping and again discount here using voucher. This is a great offer. Race 3 gonna break all records on Bollywood, booking done dona done. Requesting you to mention the code before commenting. This code is not listed.